This past Monday was Memorial Day, a federal holiday in the United States meant for honoring the men and women who died while serving in the country's armed forces. However, the last Monday of May this year also happened to fall on the 29th of May, which has been dubbed “529 Day” in order to help raise awareness about the importance of saving for college, specifically through the use of a 529 plan. Indeed, a 529 plan is a flexible, tax-advantaged savings vehicle that makes it easier for people to set money aside for their kids’ college and other post-secondary training expenses. One of the main benefits of using a 529 plan, according to the Internal Revenue Service (IRS), is that any earnings generated from investing the savings are not subject to federal tax (and generally not subject to state tax) when used for the qualified education expenses of the designated beneficiary, e.g. tuition, books, room and board. Answers to many common question about 529 plans can be found here. 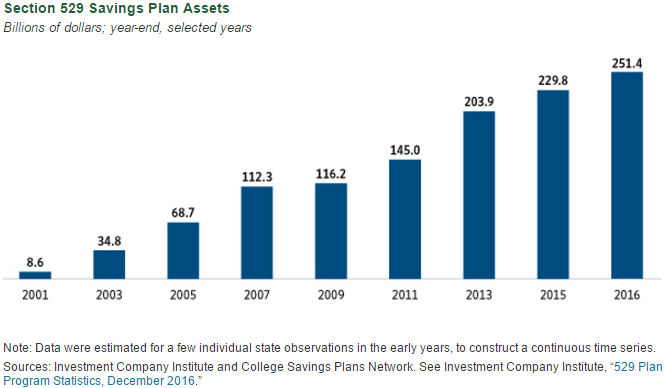 529 savings plans, named for the section of the U.S. tax code that their favorable tax treatment is derived from, have in recent years become an increasingly popular method of saving for college. 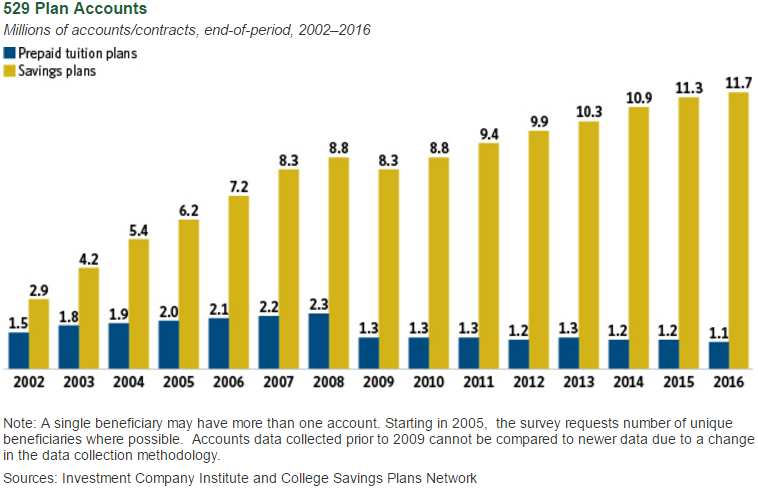 In fact, there were 11.7 million section 529 savings plan accounts at year-end 2016, according to Investment Company Institute (ICI) and Colleges Savings Plans Network (CSPN) data, up sharply from 2.9 million in 2002. Further, the total assets held in these accounts surged from $8.6 billion at the end of 2001 to $251.4 billion at the end of 2016 (ibid). A key reason for utilizing these savings vehicles is that they can help eliminate, or at least reduce, your child’s ultimate dependence on student loans, which as a share of total household debt in America have more than doubled from 4.8 percent in Q3 2008 to 10.6 percent at the end of Q1 2017. That is extremely valuable considering that paying off student loan obligations does not appear to have become a lot easier for graduates even after more than seven years since the “Great Recession” ended, according to recent data on loan delinquencies from the Federal Reserve Bank of New York. Reducing student loan liabilities will also free up the amount of your child’s disposable income after graduation that can be put to better use in a tax-advantaged retirement savings plan, such as a 401(k) or IRA. That is terrific because the sooner people can start setting money aside for retirement, the more likely they will be able to hit the savings target that allows them to achieve a comfortable and financially secure lifestyle in old age. Such positives can also be shared with the parents who set up the 529 plan for their children because this savings vehicle will help them avoid tapping into their retirement nest egg early. Moreover, a majority (53 percent) of U.S. parents surveyed by T. Rowe Price said that they would rather dip into their retirement savings to pay for my kids’ college education than have their children rely on student loans. This sentiment may be partially due to parents' personal experiences with student loans because 44 percent of the respondents who stated that they used student loans to pay for their own college education said that paying off that debt has significantly limited their ability to save for retirement.